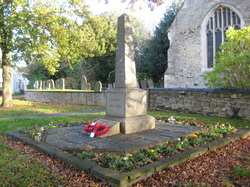 At a ceremony in Simpson in February 1923, a granite obelisk memorial and a wooden Roll of Honour were dedicated to the memory of the 11 men of the parish who were killed in World War 1 and the further 76 who served and returned. Exposure to the elements over the years has resulted in both obelisk and board becoming dirty and the names undecipherable. To mark the centenary of the start of World War 1 both memorials have been cleaned and renovated and the wooden board has been remounted in the newly decorated porch at St Thomas’s Church. As part of Simpson’s programme of centenary commemorations, there will be a ceremony to rededicate the memorial and Roll of Honour on Sunday 14 September. It will start at 12.00 and last about half an hour. The bells of St Thomas’s will be rung between 11.40 and the start of the ceremony. After the ceremony, a light lunch will be available in Simpson Village Hall, two minutes’ walk from the church. There will be a small exhibition about some of the men from the parish who served during the war. The hall will be open from 12.30 – 5.00. If you come by car, please park at the Milton Keynes Music Service at The Walnuts. The entrance is on the bend almost opposite the church. We held a commemoration concert in the Church in September to remember those that had served or died in WW1. Church folk, villagers, friends and families got together to produce an event that was evocative of the time. We had a Memorabilia table which was laden down with mementos from the war - family photos, letters from the front, medals, newspaper articles and books. It was touching to think that so many people had hung on to their families memories which spoke of the fortitude borne by so many people of that time. Naturally there were many recitations of the war poets including some extracts from the Wipers Times - recently featured on TV, and one from a German war poet. A moving letter written home was read that had been sent by a grandfather the evening before he faced the Battle of the Somme. We had plenty of music. Singers performed a piece written by a local composer especially depicting the way it was for Simpson during those years. The bells were rung during this piece. We had individual singers and a duet and a rousing singalong for all of us - Pack up your Troubles etc. also a poignant guitar solo of Somewhere over the Rainbow. The evening finished with all singing Land of Hope and Glory and Nimrod playing. Fundraising 2014 - Well Done all of Us! In 2014 the community of Simpson and Ashland, with the help of friends and families, raised £13,772 for Charities, Good Causes and Woughton Parish Churches through the quizes and social gatherings. Well done all of us. Thanks must go to Santander Bank for supplying £4,779 of the total under their matching scheme. Most of the events have taken place in Simpson but a few have been at other venues in Milton Keynes. Not included in this total is money raised by others this year e.g. the Christmas Fete which produced even more funds raised by the Simpson and Ashland Community, in fact over £600 for the Children's Society. Thanks to all who have participated in any way – coming along, donating money, cooking, singing, reciting, playing music, supplying raffle prizes, setting up and clearing up, making teas and all the other tasks needed to raise the money. This is a real joint effort. As well as enjoying ourselves, we have also provided food for the homeless, clothes for interviews, seeds for planting, food for the Food Bank, a donation to the Ebola Appeal and information on each of the benefitting charities. On Sunday 26 April the ladies of Simpson provided a sumptuous tea-party in St Thomas Church announcing "if you can’t get to the Ritz, we will bring the Ritz to Simpson”. Those who attended were treated to delicious sandwiches and savouries, scones with cream and jam, cakes and pastries and pots of tea, served by waitresses wearing lace caps and aprons. It was a very jolly and convivial afternoon and our thanks go to Mr J. Hughes, Mrs Y. Morris, Mrs J. Shepherd, Mrs P. Hodges, Mrs M. Young who waited on their guests; Mrs J. Anderson & Mrs L. Bates who kept the teapots full; Miss S. Lewis, Mrs Whalley & Mrs P. Sutcliffe who welcomed those attending & organised the raffle which had too many prizes to list here and Mrs J Mattinsley who played the piano so beautifully during the event. In all, over £400 was raised and a donation has been given to the church funds, the rest going to CarersMK, which supports families caring for disabled & elderly relatives. And so a big thank you to all those who attended and helped raise this contribution. The History Group has begun to research the names of the men from the parish of Simpson who fought in that war and we intend to produce a book about some of them next year. In addition, there are plans for an evening of music and poetry related to those times. We will keep you posted via the parish website and through the Newsletter. Pip Parry, who died on 27th November in Five Acres Nursing Home, lived in Lissel Road, Simpson from 1986. He and Phyllis arrived from Reading, following their daughter and son-in-law who had moved into Hanmer Road three years earlier. Pip was a retired academic who had taught geography at Reading University. He enjoyed music - especially opera - travel and watching football. The move to Simpson was a great success: he and Phyllis loved the view from their windows across the fields towards Caldecotte and they enjoyed their many walks around the lake. Until Pip grew very frail, he would be seen every day walking around the village. As a result, Pip’s pieces are performed by amateur groups around the world. The family was delighted that Christina Lay, a long-time member of the Third Age Players and editor of the Hidden Treasures collection, gave a hilarious rendition of one of them – ‘Don’t put your Grandma on the stage’ - at Pip’s funeral at Crownhill on 9 December. Beside drama, Pip was active in other areas of Milton Keynes life. He enjoyed delivering adult education classes on various topics, including opera. He worked alongside Phyllis as a hospital volunteer and as a fundraiser with the Willen Hospice League of Friends. It was fitting that, having enjoyed 27 happy years in Simpson, Pip was able to remain here to the end of his life. His family are extremely grateful for the kindness and care provided by the staff of Five Acres Nursing Home. £17,065 raised: Events at Simspon Village Hall and St Thomas's Church in 2013 have resulted in raising the magnificent sum of £17,065. This has been brought about by all different kinds of input and we have worked exceptionally well as a community - and beyond. ﻿This wonderful group of local residents worked really hard on ﻿Saturday 22nd February to clear the Ashland Lakes of rubbish. Bags and bags of plastic, sweet wrappers and general litter were removed to improve the lakes as a wildlife habitat and to ensure the swift running of the water. Timing was crucial, as the clearup had to happen before the sticklebacks become active following their winter hibernation. Dawn Morland , Parks Trust Ranger, was thrilled that so many residents of all ages had turned out to help. The Annual Parish Meeting was held on 12th May in The Plough, Simpson. There was good company, delicious cakes and impressive entertainment from the SAM singers. In other words, it was a great success. what goes on in the Parish, and the councillors were very pleased to share views and ideas with residents. Special thanks to the staff of The Plough, Simpson for their hospitality, and to all those who produced the boards that advertised local groups and organisations. Thanks to all who have contributed their comments to the work on Safety Improvements to the H9. TRAP continues to ﻿work closely with the MKC Road Safety Officers who did a sterling job at the April 2nd Drop-in, explaining the proposals and collecting the views. Following the annual budget process, additional funding has been made available by Milton Keynes Council to enable the no 18 bus to return to an hourly service from April 2014. Local residents worked hard to put togther a case for reinstatement and now have to encourage better use of the bus service. USE IT OR LOSE IT. For more information download (right click) the latest Getting Around Update. TRAP continues to work with Milton Keynes Council and Canal & River Trust to improve the condition of routes around our parish and ways of 'Getting Around'. Contact the parish clerk to find out more. "I really enjoyed the occasion and I know others did. I realise the chief purpose was making funds for the Food Bank (which you achieved admirably) but you also did a great service to the community." " Lovely to see people sitting around chatting, animated and cheery. Well done indeed." "Hurrah! Really good result & worth the effort. The hall had a happy buzz about it on Saturday. " "At the time of year when everyone is indulging in themselves and family members, buying over the top Christmas gifts, your community has spent time doing something for the less fortunate and thereby brought people together - equally important. Well done!" "There was a lovely buzz about the fair and a great atmosphere, I think a lot of people really enjoyed themselves and some folk got a real social boost. And the Food Bank will benefi t too! " Simpson WI recently celebrated its 39th birthday and held a party in the village hall, enjoying a meal cooked by the committee, with a beautiful cake made by Theresa Breedon. This was followed by a birthday card-making activity. Filmmaker Lee Scriven will be returning to his roots when he screens his acclaimed Milton Keynes documentary 3 Curly Wurlys &106 Roundabouts at Simpson Village Hall on Thursday 8th May at 7.30pm. The film, starring Trevor Marshall, is based on the burgeoning era of Milton Keynes and features rare archive film footage of the city including some clips that have not been shown in public for over 40 years and some that have never been shown at all! Lee who moved to Simpson Village in 1974, spent two years making the film and it has been critically acclaimed and sold out its previous screenings at Xscape’s Cineword cinema. The special screening is part of Hanmer Road’s 40th anniversary and Lee was delighted to be asked to show the film. “Like thousands of others, moving to Milton Keynes was an a emotional and exciting experience. I do think the film gives viewers an idea on what it was like all those years ago,” said Lee. “A remarkable film about a remarkable period in a remarkable city’s short history”. 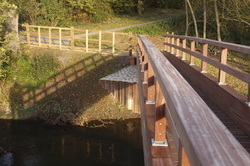 Visitors to the Ouzel Valley Park can now cross the River Ouzel in style thanks to The Parks Trust’s brand new footbridge, located just south of the H9, near Simpson. The custom-built £85,000 bridge is made from Ekki, an extremely hard timber that is used for heavy construction because of its superior strength and natural durability. 6.30-9pm: The garden of Pyes, Simpson – A bring-a-bottle party with various music on audio was enjoyed by all!